This question more towards paradigm. Why is that we don't use Event Bus instead of listeners in an MVP environment ? Typically, the "P" part has dependency injection of view and model references. Sure this has an advantage of showing explicit contract between the view and model via presenter, which is more readable. However, wouldn't it be a cleaner approach to have presenter listen to events from views and events carry the view payload (eg: json representation). Same is the case with presenter talking back to the view. View will listen for events from presenter. Major advantage is, we don't have to write interfaces for each contract between view and presenter. If you look at the code you will see that presenter is getting exposed to view details like Text Fields, which i believe is increasing coupling between view and presenter. Say, if i'm replacing front end JavaFx instead of Vaadin, i will have to alter presenter as well. This class is an example from a live project. Here we have different types of events ie i don't create event class for different cases. Eg: LoginViewEvent , DashBoardEvent etc which i believe is a maintenance pain. Simple enough, the view send the event DOCUMENT_EDIT_COMPLETE .The presenter layer handles this event. I found this way, a better way to decouple views from presenter. New event means adding event element to enum and updating respective subscribe methods handling this event. 1) This approach means, there would larger set enum elements as the application grow. Is this approach an anti pattern ? 2) As we saw it uses Event Bus extensively are there any drawbacks of using bus system instead of interface-listener pattern ? Wanted your valuable suggestion on this regard. The main issue is, if i blindly apply this pattern extensively across the project i shouldn't regret doing so, what would be a possible pitfall in this approach. It is always good (not a must) to know the internals of a software platform, to be an efficient developer. After having exposed to the internals, many facts will make more sense to during the development, further you will get the clear picture of how each components connect and interact with each other. Its been a while since the inception of the Android Mobile platform. 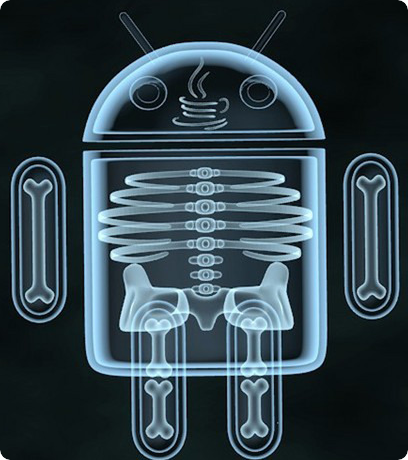 Since then, there has been higher demand for android developers, not to mention how it made easy for existing Java developers to migrate. Statistics show, most mobile and embedded devices will default to Android soon or later.Learning this platform would be worth the time spend. This article, will explain only necessary internal details just enough for user-space developer. Once complete we will have a clear picture of entire android stack starting from the source tree organisation, architecture component interaction, start up sequence, to how an application is launched. 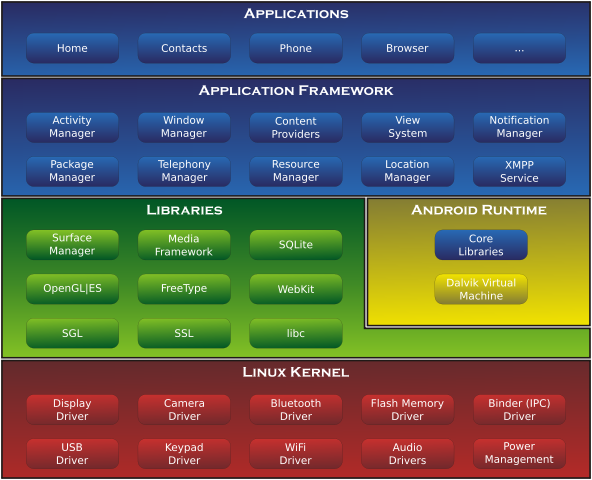 A the bottom most level, the host operating system, is the Linux kernel. Theoretically it could be any host kernel, practically, however it is a difficult task to achieve. Though, Linux kernel is being used, there were many kernel specific patches those were added to support various user level android policies and drivers. Other than the patches above, one has to keep in mind, the device manufactures do add custom patches to support their hardware, what is mentioned above are core kernel patches for a android system to work. Consist of the Dalvik virtual machine, which is just like JVM on tbe desktop, that executes the android applications we run, Java runtime, that comes from the Apache Harmony project, system daemons, the init binary and various supporting binaries. Dalvik virtual machine executes dex files instead of class files. dex files are generated by post processing class files with dx utility. This is where, the 3rd party native libraries (C/C++) are hosted, they act as a support layer for low level access from the java libraries, it consist of google developed C library called Bionic, it is stripped down library from BSD standard C library. Bionic isn't compliance with POSIX, so native (non java) application and library porting from POSIX system is a hurdle. Though only few libraries have been mentioned in the diagram, it consist of more, starting from libusb to webRTC, kindly see the source tree. So, in nutshell, these libraries are accessed by the application frame work via JNI. Ah, finally we are at the top, the android. * APIs you see in the Android API reference sprouts from here, this is what we mostly use while developing an android applications. Framework don't just consist of developer apis, but, various services and interfaces to communicate with them. Services are not directly accessible via framework , however, via kernel supported mechanism called Binder. In short andorid. * APIs connected to service / system server via binder. There is were we have all the fun, we use the SDKs to access these framework APIs to develop the applications. Most of the application developers play here. There are other species of developers who hack the frameworks , android services and even the kernel subsystem to build custom roms, one such community is the CyanaogenMOD, we should say they are the first class android developers and us to be economy developers. ;-). Most android devices have set of default applications like dialers, mms, browsers you can find its source tree over here. Kernel does provide HAL , however Google engineers felt it wasn't enough, one reason could be GPL license that the kernel has. So, in order to make device manufacturers implement non GPLed drivers in the user space, this may be a favorable choice. Libhardware provides interface for various devices and sensors, the device manufacturers can develop drivers in closed source environment, complying to these interfaces. Few of the interfaces are listed here. Case Study : If you like to know how RIL is used for receiving calls, sending sms, receving sms etc take a look into this answer. /system Immutable directory coming from the original build. configuration files, standard apps, etc. apps, data added by the user, data generated by all the apps at runtime, etc. which provides for user accounting. 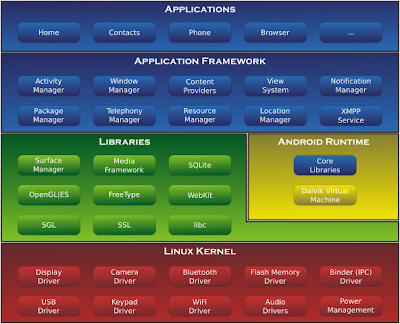 system/ contains all the basic pieces of the Android system: init, shell, the volume manager, etc. Start up sequence till init is quite straight forward, this is similar usual x86 boot process, finally calling Init , however Android system differs starting from the init sequence. The init itself was written from scratch and not same as the one seen on Linux distribution. Once the kernel start /init process, it reads the file name /init.rc and /init. (machine-name).rc , these rc script, first of all sets the environment variables, mounts various file system to its respective mount points, starts various daemons like rild (radio interface layer daemon), adb , vold, netd etc. Init become mother of all the process created subsequently. 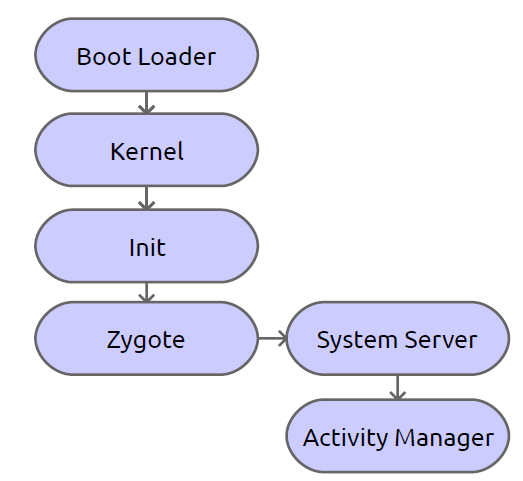 The next core job of init is to start up the Zygote, which is the mother of all the android applications. 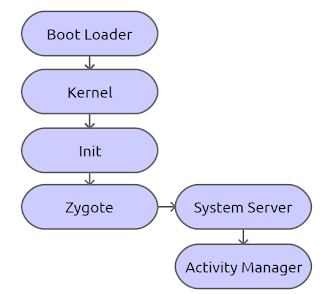 Init runs the /system/bin/app_process and name it zygote. The entry above from ./init.rc that start the app_process to startup the zygote. It start up the java implementation of Zygote , and 'start-system-server' flag is passed as the parameter. This is exactly what we had passed in the entry from the init.rc. The line 189 does many other tasks under the hood, the runtine.start() at line 839 start up up the Dalvik virtual machine, see line 443 of AndroidRuntime.cpp for more information.Ahead of zygote invocation, Dalvik runtime was setup and Dalvik virtual machine was initialized. ZygoteInit::main() get called at line 888 of AndroidRuntime.cpp , which start up the System Server this can be seen at line 544 of ZygoteInit.java, finally it runs runSelectLoopMode() and waits for future request to fork() new zygote instances which specialize into the android application.The System server is started in a two sequence process , first a libary is called to initialize the native services, which can be seen at line 1064 of SystemServer.java , then java based core services are run by ServerThread::run() which is seen at like 1067 of SystemServer.java. Check the source to find out the sequence of the services started, core services line the PowerManager, ActivityManager, Sensor Service etc and other non critical services are started this way. The main being the AcitivityManager, which handles the our Andorid Application. 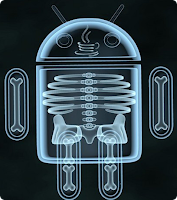 Ah finally we have reached the end, though this was quick introduction into the android internals, it is my humble opinion that , information above would be sufficient enough to get you started with griping the Android APIs. This introduction will hopefully help you understand the relations and component interaction, which would make android application programming more exiting. Where go from here ? Now you can start reading Application Fundamentals from the android main resource, trust me, many things will make more sense now. This tool generate version or build information in a source file format from a pointing local git repository, during the pre-build phase. Currently only supports java code generation. However can be extended to a more generic plugin based system to support other programming languages. Tool favors command line arguments instead of configuration files to read the parameters, this decision is to speed up the tool, as this tool may be run numbers of times in a time slice. You can use this in your build script in pre build phase, use in eclipse without a build script is just a use case. Policy of when to run is left to your creativity. * This is an auto generated file, modifications will not persist. It is highly advised to place .gitingore in the version-file-directory with .gitingnore content being 'VersionInfo.java'. As this file is updated frequently, it may cause git issues during commit and merge.Further to avoid git issues ignore the *class files. In the refresh tab of new builder setting specify the resource ie our version source file to be refreshed when ever tool is run. An example using built in TimeUnit .